← Now I know why I’m working on Saffron Magazine – for the best sourdough bread ever…. Life is slowly returning to whatever passes for normal now that Everest Base Camp is just a cold but very happy memory. I am still eschewing most media – TV, newspapers and the Today programme all seem like far too much irrelevant noise after a three week break when the main concerns were keeping clean, warm and managing to eat enough to give me the energy to trek. My diet is still all over the place though as I seem to be craving bread and chocolate – and the cold weather here hasn’t helped so far. But today the spring sunshine brought a welcome desire for healthier foods – raw veg in lots of colours and textures seemed to fit the bill so I visited Cherry Orchard Farm, the wonderful local organic farm shop, stocked up on carrots, peppers, courgettes and their lovely home grown salad leaves. Then out with the Bamix blender and whizzed up a bowl of (very garlicky) hummus. About five years ago I made a vow to make a lot of foods from scratch that I had got into the bad habit of buying off the shelf. On the whole these dishes were much tastier home made, far cheaper and really not a lot of effort to make. Hummus was the star player in that list. It uses four or five ingredients which I always have to hand, is made in about 5 minutes, and then can sit in the fridge waiting for those hungry moments. Here’s the recipe from The Busy Mum’s Cookbook that I made today…. 1 Place the chickpeas in a processor or blender with the cumin, garlic, lemon juice and seasoning and whizz until almost smooth. Add a bit of their juice if the mixture is too thick. (It should be like soft mashed potato!) Add the tahini and olive oil and blend again quickly to mix. Transfer to a bowl and stir in two thirds of the chopped onion. 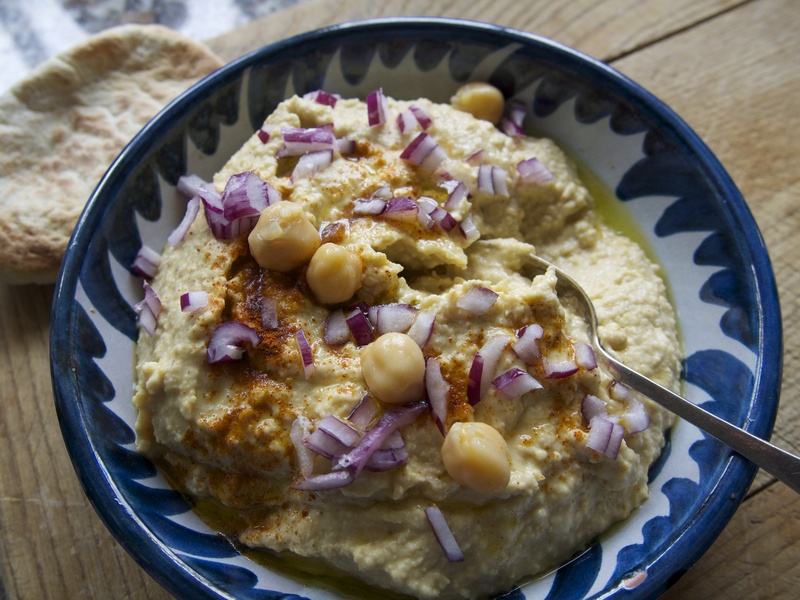 2 Spoon the hummus into a serving bowl and scatter with the remaining chopped onion, a few chick peas and a slug of olive oil. Serve with warm pitta bread and vegetable sticks. Keep covered with cling wrap in the fridge for 2 – 3 days. Busy mum’s lifesaver: Keep a selection of ready prepared veg sticks in a bag in the fridge both for them and yourself. The easier you make it to snack healthily the better all round. And as with all recipes but especially the simplest ones, the better the quality of the basic the ingredients the better the results. 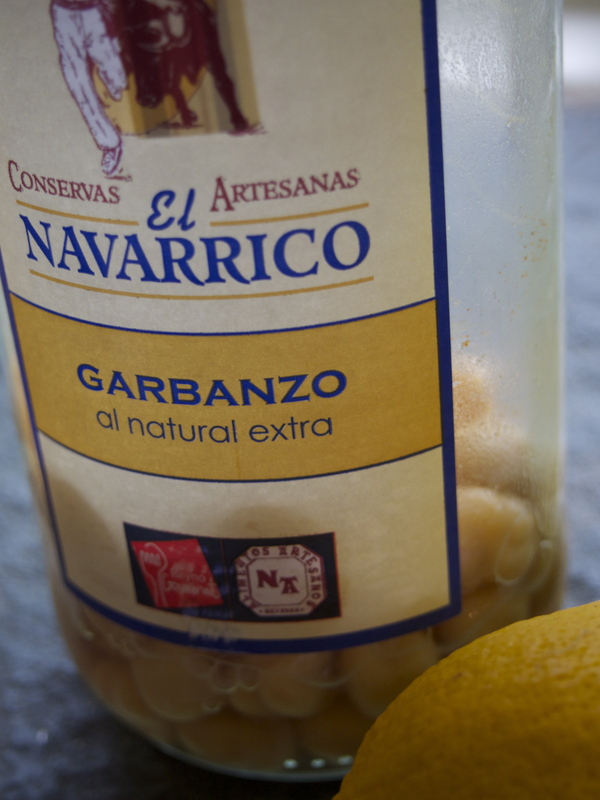 So I use these Spanish chickpeas or, if I have time (so not today! ), soak and cook dried ones for the best texture and flavour of all. Then I make a big batch and freeze it in pots for when the children all come home. This entry was posted in Recipes and tagged hummus, Recipe, vegetarian. Bookmark the permalink.